A trapezoidal or triangular shaped pastry filled with various savory items, like mashed potato, chicken or lamb mince with spices and either deep fried or baked. Very popular snack all around the world, particularly in Indian subcontinent and the middle east. It is served as a starter in Indian restaurants probably as a vegetarian option. Many supermarkets now sell samosas as snack items in their fresh food aisles. It is a common practice now in the UK to offer as birthday treats for colleagues at work places – replacing the sweets. A popular choice and a smart option that does not cost too much. 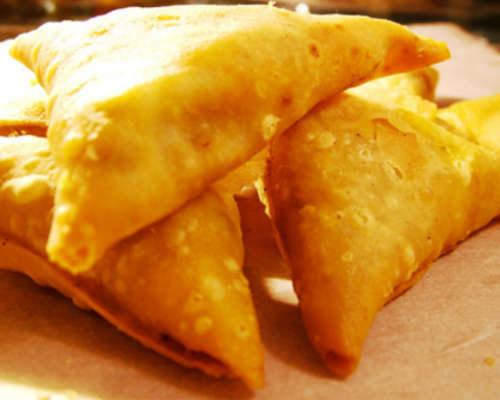 Historians believe that although samosa originated in middle east prior to 10th century, it was introduced to the Indian subcontinent in the 13th or 14th century by traders from the Middle East. Mainly there are two types, vegetarian and meat samosas. 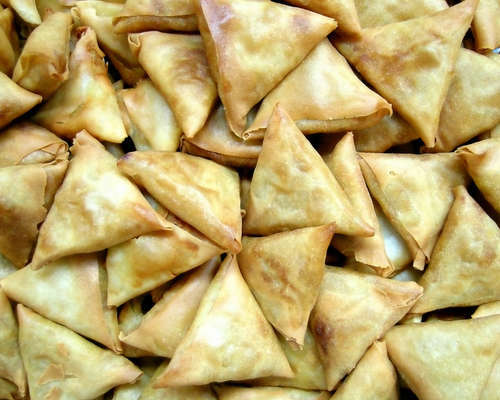 It’s not uncommon that samosa is not always a savoury snack! Sweet samosas are also popular in some regions – filled with grated coconut with sugar or milk products and then dipped in sugar syrup.